Why should you wait around for a special occasion to make some amazing cakes? We think they're good all year long! Our latest eCookbook, Classic Cakes: 24 Easy Cake Recipes to Enjoy Year-Round, is a wonderful place to start! It's time for you to live out your secret bakery fantasies with "Quick & Easy" cake recipes you won't want to miss! All of these classic cakes are guaranteed to deliver that “OOH IT'S SO GOOD! !®"
Welcome to our own version of dessert heaven with these fantastically easy cake recipes, perfect for any time of the year. Whether you've been searching high and low for the perfect birthday cake recipe, wedding cake recipe, or regular-Thursday-night cake recipe, the Mr. Food Test Kitchen is here to help you out. From moist chocolate cakes to melt-in-your-mouth carrot cakes and everything in between, you're sure to be baking up something tasty all year-long! Plus, with these quick cake recipes, you won't have to wait long to satisfy those late night cravings! We've even organized them by flavor so you can easily choose your favorite from each to test out your culinary skills. So what are you waiting for? Come see what decadent desserts we've got in store! Plus, for frosting ideas, check out our collection of Homemade Frosting Recipes: 14 Frosting Recipes for Cakes, Cupcakes, and More. 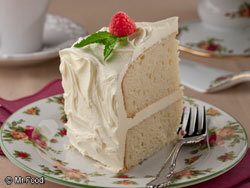 Download your free copy of Classic Cakes: 24 Easy Cake Recipes to Enjoy Year-Round today. 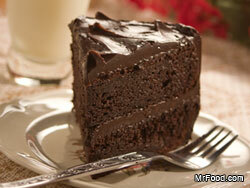 How can you resist the classic appeal of a really good chocolate cake recipe? For that tasty country flavor you've come to love, you've got to check out our recipe for Old Fashioned Southern Chocolate Cake (page 1). This airy and light cake recipe will make you wish you were sitting out on your porch, enjoying a cool breeze on a lazy summer night. If you've been looking for the perfect chocolate birthday cake recipe, you'll have to check out our Chocolate Cola Cake (page 4). When your kids find out it uses their favorite soda, they're simply going to be begging for more! Stop picking up generic cakes from the store; you know your family is going to love the TLC you inject into a homemade chocolate cake, not to mention, it tastes so much better! Not everyone's a chocolate fan — we know it might be a bit of a shock! These white cake recipes will absolutely hit the spot, whether you're nostalgic for a classic cake recipe or you need a basic cake recipe so you can have some fun with the toppings! You've heard of the wonders of a red velvet cake recipe, but have you heard about our White Velvet Cake (page 5)? For a bakery-quality cake in under an hour, this easy cake recipe is sure to leave you smiling! If you're looking to add a touch of European elegance to your dose of baking therapy, you'll certainly want to check out our recipe for Italian Cream Cake (page 6). This layered cake recipe is one for the books! With both buttermilk and cream cheese frosting, you're sure to lick that mixing bowl spotlessly clean! These easy cake recipes brought to you by the Mr. Food Test Kitchen have all been triple-tested, ensuring that your dessert will come out of the oven picture perfect! The best part? Cakes are the perfect make-ahead dessert! Are you meeting with your book club on a Monday evening but you don't have time to bake beforehand? Not a problem! Whip up one of these classic cakes the night before, and frost it right before you leave for that fresh-from-the-oven taste you love. Plus, these amazing cakes are so versatile! You can dress them up and decorate them to your heart's desire, putting a new spin on the phrase "starving artist." If you're looking for a reliable cake recipe that you know is going to turn out right, Classic Cakes is the eBook for you! Our triple-tested method guarantees that each of these amazing cakes are chock full of that “OOH IT'S SO GOOD! !®"
If you ask your friends and family what their favorite fruit is, chances are many of them will emphatically answer "Strawberry!" 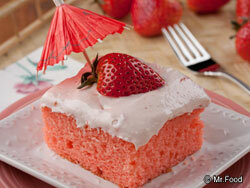 For a touch of delicate class, you'll want to try out our Pink Lady Cake (page 9). Using only four simple ingredients, this is one cake mix recipe you can easily make on the fly! We know how much you love chunks of fruit in your dessert which is why our irresistible Layered Strawberry Cake (page 10) is the guilty pleasure you've been looking to find. Using strawberry preserves, freshly cut strawberries, and whipping cream, you'll be on the edge of your seat, waiting to cut yourself a slice of fruit dessert heaven! These easy cake recipes are a burst of refreshing strawberry flavor that you and your family won't be able to refuse. You can never have enough recipes that inject a burst of sunshine into your life! The pop of flavor in these lemon cake recipes are sure to brighten up even the gloomiest of days. While most people may save their favorite slice of cake for dessert, we think our Lemon Pound Cake (page 14) recipe suits morning just fine! With a hint of that sweet lemon flavor, this breakfast cake recipe has that ideal blend of flavors that makes for a tasty breakfast cake. If you're looking for an easy cake recipe that's sure to remind you of Grandma's home-cooking, you'll need to check out our recipe for Lemon Meringue Cake (page 16). 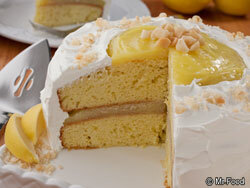 This 5-ingredient cake recipe is sure to turn anyone and everyone into a lemon cake enthusiast! Adding a generous slice of carrot cake to the conclusion of a meal is a surefire way to win the love and adoration of your family. Simple or all-dressed up, these easy cake recipes are both classic enough to please and unique enough to liven up your regular dinnertime routine. 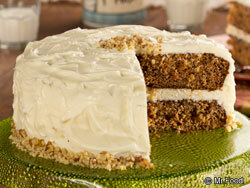 Classic Southern cooking has never tasted better than in the form of our Buttermilk Carrot Cake (page 17). Using hints of cinnamon and crushed pineapple, this is one recipe that's sure to make your list of signature dishes in no time! Plus, you won't want to miss out on our recipe for Shortcut Carrot Cake (page 20). Who says you need to make everything from scratch for it to taste 100% homemade? Less time baking leaves more time for eating! 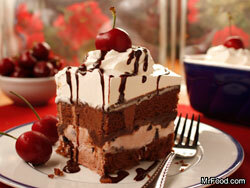 Turn your mealtime into a cultured affair with the classic German specialty: Black Forest Cake. These easy cake recipes pay homage to this European dessert through layers upon layers of chocolate, whipped cream, and cherries. What's not to love? Nothing tops off a fun-filled day like ice cream which is why you won't be able to resist the allure of our Black Forest Ice Cream Cake (page 21). Drizzled with sinfully rich hot fudge, this is a cake you're going to want to have around for those days when you need a little pick-me-up. For those who might be a little short on time (and patience! ), we recommend trying out our simple recipe for a Black Forest "Quickie" (page 24) — you won't even believe that it only uses three ingredients! Plus, don't miss out on our newest eNewsletter: Just Desserts! Featuring decadent, homemade dessert recipes, this bi-monthly newsletter will help you "wow" your family and friends with tasty desserts everyone is sure to enjoy. As a fan of Mr. Food's Quick & Easy cooking philosophy, I know you can see the value in this free ebook. Try out these easy cake recipes with the free Classic Cakes: 24 Easy Cake Recipes to Enjoy Year-Round. Once you subscribe to receive our newsletter, you'll see how much fun it is to be a part of the Mr. Food community! If you've ever searched for quick and easy recipes, fast dinner ideas, slow cooker recipes or anything in-between, let MrFood.com deliver triple-tested recipes straight from our Mr. Food Test Kitchen that are both easy to make and delicious to eat. Check out this free eBook and the MrFood.com site to draw tons of inspiration for your next holiday or meal! I am excited about receiving recipes for my favorite cakes. RE:"CATERPILLAR"...just want you to know how much I appreciate "talent" and creativity. It looks so good that I wouldn't be able to eat it, before serving it. SO REAL. My baby sitting jobs are going to college and the 1st one is in the NAVY as a corpsman. This is wonderful, keep it up. I made the White Velvet cake and followed the instructions to the tee, but it turned out extremely dry. All my ingredients were fresh, eggs, baking powder, flour, sour cream, etc and the cake really didn't even rise that much. It wasn't moist at all. Did I over beat the batter? It sounds wonderful, will try for it now. The file you download for book will not open because it is not a PDF file, so do not contact my email address.